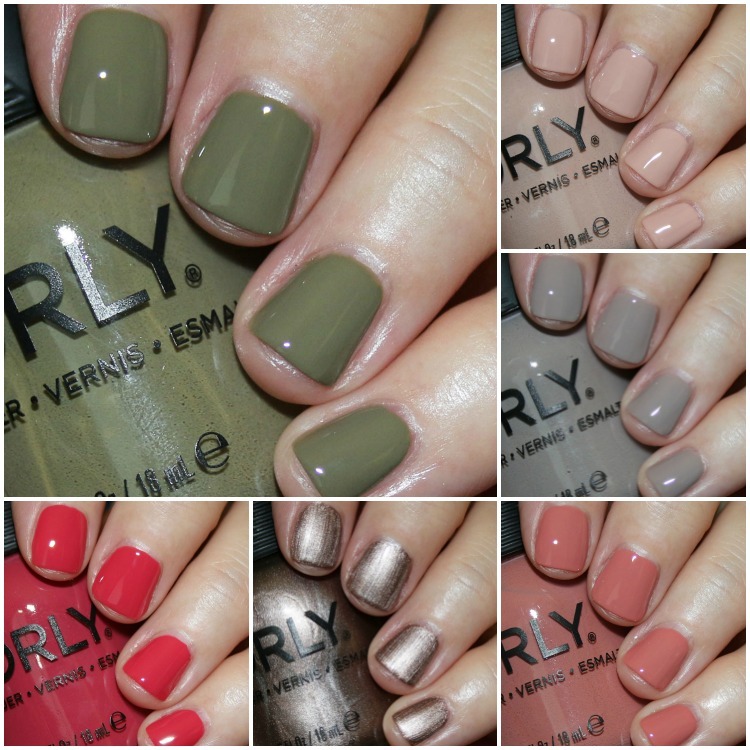 The ORLY The New Neutral Fall 2018 Collection just released and I’ve got swatches of it! These swatched very nicely and I really had no issues. All of them were just two coats over a ridge-filling base coat. This collection is part of their Fall Color Pass box. In case you aren’t familiar with it, it’s a subscription where you get early access to four color collections a year with free shipping. They also include some extra goodies and this one comes with silver and gold nail foils and their Flash Dry Drops. The Color Pass is $119.00 a year and you can save $10.00 using code VAMPYVARNISH. Snuggle Up is a very pale beige creme. Cashmere Crisis is a light grey creme. Mauvelous is a medium pink/mauve creme. Olive You Kelly is a medium olive green creme. OBVIOUSLY this is the one with the great name, haha! Fall Into Me is a metallic, sparkly mink brown. Use thin even strokes or this can be a wee bit brush-stroke-y. Seize The Clay is a muted red/pink creme. So there you have it! I know many of you die-hard nail fans might think this isn’t the most exciting collection on earth because we have seen a lot of these colors, especially in other fall collections, this year. I totally understand that and agree. The more interesting colors here are Cashmere Crisis, Olive You Kelly (not just for the name) and Fall Into Me. You can find the ORLY The New Neutral Fall 2018 Collection on their site now and they are $9.50 each. And don’t forget, you can sign up for the Color Pass Box and get $10.00 off with my code VAMPYVARNISH. Do you see anything here that is on your list for fall? As always your swatches are lovely! I have a pretty extensive polish collection so not much here that’s unique for me, but I must say I do love the olive one. That is a color I don’t have in my stash that I”ll wind up getting.